Talk N Text prepaid revamped the T20 unli talk promo now with added unlimited texts to all networks aside from unlicall to Smart, TNT and Sun Cellular. You still pay the same amount when you load up your account at your nearest loading retailer. For 20 pesos your combo T20 is valid for 1 day and can be extended up to 365X for additional 5 pesos. Not just that, you will also enjoy free internet of up to 30MB per day and get free access on Facebook, COC, Twitter and more apps. 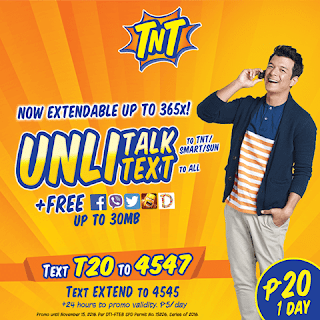 You can also extend this promo using How To Extend a TNT Promo for only 5 Pesos. Never miss to communicate with your love ones and friends using this T20 promo, valid until November 15, 2016. You can visit TNT website and social media pages for updates, connectivity concerns and additional information about this promotion.